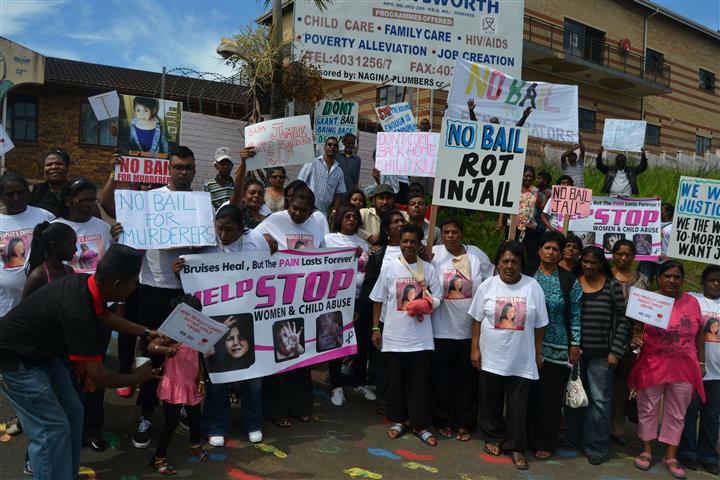 Members and volunteers from Child Welfare Chatsworth holding a protest outside their premises. The protestors then marched to the court. Picture: Rising Sun Chatsworth. The Baby Jamie murder case has been adjourned to May 5 due to first accused, Patricia Kershnie Ishwarlal, 31, still undergoing mental evaluation at Fort Napier Hospital. The 55-year-old grandmother of Baby Jamie, Salatchee Venilla Basanich, who is the second accused in the murder case, made a brief appearance in the Chatsworth Magistrates’ Court on Thursday, Rising Sun Chatsworth reported. State prosecutor in the case, Lolly Soobramoney, confirmed that Basanich had been released from Fort Napier Hospital, while Ishwarlal was still being evaluated. “We are waiting for the results of the mental evaluation of both the accused in the matter,” said Soobramoney. Basanich was remanded into custody at Westville Prison. It is believed the two-year-old baby, who was buried in December last year, had been tortured and beaten to death, allegedly by her mother and maternal grandmother.